Once Again, The Best Keeps Getting Better! 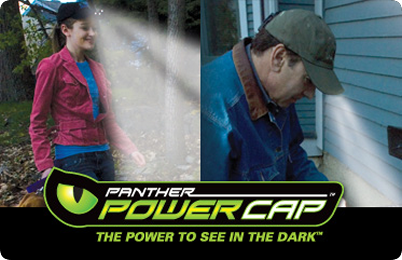 The NEW 4 LED PowerCap™ Stealth is the "ultimate hands free torch"! 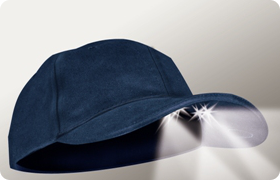 Our 4-LED PowerCap™ Stealth illuminates with all of its lights UNDER THE BRIM, making it the most discreet and advanced LED Cap Light ever! Illuminating what you’re looking at without having to hold a torch or put on a bulky headlamp. NEW! 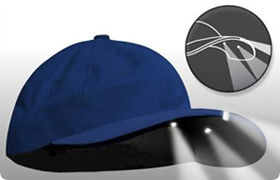 and by popular demand for Autumn 2013 is the return of the under brim "3-Way " switch offering separate low and high beam on/off. All of our caps are made with our patented LED lighting technology. Combines discreet 2 Low Beam UNDER the brim LED’s for up-close tasks and 2 High Beam UNDER-the-brim Ultra-Bright LED’s for long distance lighting. Power Beam (all 4 White LED’s) when you really want a lot of light. Perfect for: the Building Trades, Home DIY, Automotive work, Concert / Theatre / Event Production, Film & TV production, Security / Police / Emergency personnel, Camping, Hiking, Fishing, Hunting, Power Cuts; anywhere hands free lighting is needed. 3 Colours available – Navy blue, Black, and Stone. 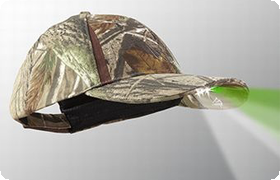 The 4-LED Performance Running Cap is the greatest new tool for your early morning or evening training! No more inconvenient and bulky headlamps. Patented C.U.B. 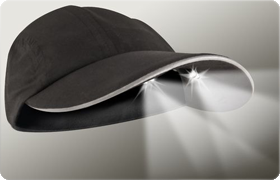 (Concealed Under Brim) Technology™ allows you to light area in front of your feet with 2 Ultra bright LEDs built UNDER-the-brim and lighting the distance ahead of you with 2 Ultra Bright LED built UNDER-the-brim. Lightweight training cap made of entirely of the highest quality moisture wicking materials available. High performance mesh, and high performance moisture wicking weave sweatband. Combines switchable 3 Low Beam Green LED’s and 3 Ultra Bright white LED’s to provide the "ultimate hands free torch" while protecting your night vision! Power Beam (all 3 White LED’s) when you really want a lot of light. A must have when fishing or hunting. Combines switchable 2 Low Beam UNDER the brim LED’s for up-close tasks and a High Beam single Ultra bright LED in the centre of the brim for long distance lighting. 2 Colours available – Black and Navy Blue.